Forgetting Windows 8 password will become one of the most common problems and it can become a critical problem if your system contains important data. 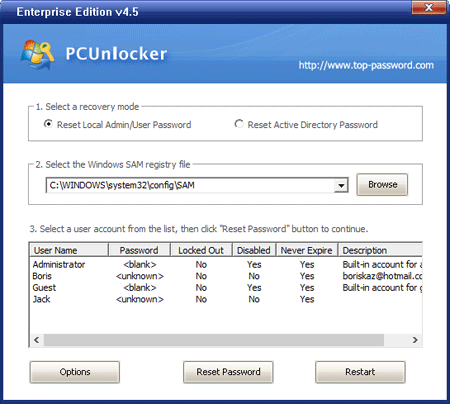 Advanced users can easily remove passwords from the computer but average computer users don't have any idea about password reset disk and other methods to reset the password in Windows 8 or any other Windows versions. Here are some tricks you need know in case you forgot Windows 8 password. The first two tricks below are precautionary measures to prevent you from forgetting Windows 8 password. The last trick will be helpful when you already forgot Windows 8 password. A password reset disk could really come in handy if you ever forget Windows 8 password. The problem with this method is that you have to create the password reset disk before the password is lost. Assuming that you have created it in advance, then you can use this method to reset Windows 8 password easily. Once you've typed the wrong password, Windows 8 will show a Reset password link below the login box. Try to set a good password hint for your Windows 8 user account. A good password hint is something that would confuse other people when they read it, but when you read it, you immediately know what it means and what your password is. That way, people can't guess your password but then you know what it is after you read your hint. Boot your locked computer from the newly burned CD/DVD or USB flash drive. Wait until the boot process is finished. When a window pops up with all your Windows 8 user accounts, select the target one to reset its forgotten password. Re-installing Windows 8 is always an option, but we consider that a last resort. Installation will help you reset Windows password, but also erase your important data on computer. So don't try this method unless you don't have other solutions. With the 3 tricks above I think you'll never get into password forgotten trouble now or further.